Let's face it, trees and shrubs need a balanced nutrient mix for proper growth and survival-- just like we need a balanced mix of vitamins and minerals in our diets. In a natural setting, trees are fed by the rich blanket of humus on the forest floor. However, in our urban landscaped environment, fertilizer is needed to take the place of this natural food. Our urban landscape also imposes additional stresses on trees and shrubs that are not a concern in the forest setting. Stress caused compacted soils, air pollution, road salts, poor drainage, and competition with turf grasses can impair the health and ultimately the growth of the tree. Without realizing it, our stressed trees are becoming more and more susceptible to infestation by insects and disease, further compounding the restricted grow. With that in mind, one of the best ways we can help our landscape plants grow healthier and to make them more resistant to pest infestation, is to ensure they receive a proper supply of nutrients. This is the most effective method to fertilize trees. This process injects a water and fertilizer mixture under high pressure 8 to 10 inches below the soil surface, right where the feeder roots are. The injections are placed in a grid pattern in and around the tree's drip line. There are many advantages to fertilizing this way. The high pressure injection forces the water fertilizer mix throughout the root zone, which not only feeds all the roots, but also reduces soil compaction and encourages additional root zone aeration. 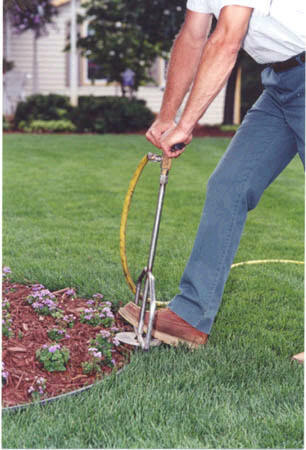 Depending upon your plant varieties, and their general state of health, this deep root injection fertilizer technique may be suggested at various times throughout the season, although, spring and fall are generally the best times of the season. Even though your trees and shrubs may appear to "look healthy" today, call us for an analysis and our recommendations on a Deep Root Fertilization program to help keep them healthy and strong for years to come. Tree roots perform many functions. The Primary roots grow down into the soil to provide the anchor to hold the tree upright. Secondary roots branch off and extend radially and horizontally and form the basis of the moisture and nutrient gathering system for the tree. Tertiary roots are the ephemeral absorbing roots eventually branch off into clusters of Rootlets, or fine hair like feeder roots. It is these feeder roots, in conjunction with natural mycorrhizial fungi in the soil that break down the nutrients found in the soil, and begin to transport them with the tree system. While the primary and secondary roots can be found rather deep in the soil, the tertiary and feeder roots will be relatively close to the soil surface. These roots will grow horizontally, to just beyond the outer drip line of the crown or foliage. This is where we must concentrate applying fertilizer for the trees to benefit the most. These applications are usually timed for late fall and/or early spring. It is important to remember that tree roots remain active year round and the tree will benefit from these fertilizations even though rge tree may appear dormant. Most trees prefer a fertilizer with a 2-1-1 ratio, such as 10-5-5. Why fertilize a tree? If you fertilized your lawn, you may not have fertilized your trees. Tree care companies have specialized equipment that can deliver fertilizer right where the trees need it � the tree�s root zone, just below your lawn�s root zone. In forests, trees shade out grass and other plants so the tree�s roots don�t have to compete with roots of other plants. Trees are free to absorb all the nutrients they need. Your lawn is a harsher environment for trees. In your lawn, trees must compete with grass roots for valuable nutrients. When you drop fertilizer on top of your lawn, the grass receives most of the benefits. A different type and method of fertilization is used to fertilize trees than what is used to fertilize lawns, since trees don�t grow the same as grass. For trees, slow release fertilizer is applied directly to the tree roots, just below the grass roots. This can be done with special liquid fertilizers injected into the soil (sometimes called �deep-root fertilization�) or dry fertilizers poured into holes drilled into the root zone of the tree. Trees also respond to fertilizer differently than your grass. Over-fertilization can create tree health problems, so the need for fertilization should be determined by measuring annual growth, checking visual symptoms and/or chemically analyzing the soil or tree leaves. Tree fertilization should be done according to ANSI A300 Part 2 standards for tree fertilization. order a free price quote and Tree inspection online. Click the link below.